���� Republic of Texas, 1842; a party of Texas Rangers led by Major Chevallier (Brian Dennehy), which includes veteran Indian fighters William �Bigfoot� Wallace (Keith Carradine) and Shadrach (Harry Dean Stanton), novices Augustus McRae (David Arquette) and Woodrow Call (Jonny Lee Miller) and resourceful whore Matilda (Patricia Childress), is ambushed by the war party of the famous (or infamous) Comanche leader Buffalo Hump (Eric Schweig) and barely escape with their lives although some of the party are killed. Three months later the survivors join the expedition led by Colonel Caleb Cobb (F. Murray Abraham) who is being sent by the Governor of Texas to Santa Fe in New Mexico to annex the area to Texas. The expedition is a disaster from the start; the terrain is unforgiving and the men face starvation and thirst, Cobb is unfit for command, men desert or turn back and the Texans are outsmarted and outfought by Buffalo Hump�s braves at every turn. Then, when the remnants of the expedition, hungry, thirsty and low on ammunition, actually come into contact with Mexican soldiers they are quickly forced to surrender. But their ordeal is not over for, guarded by a detachment of soldiers led by Captain Salaza (Edward James Olmos), the captives are marched, shackled, across a desert that is so inhospitable even Apaches think twice about crossing it. And, for the survivors of this terrible journey on foot through freezing cold with little food or water, an uncertain fate awaits. ���� Dead Man�s Walk (the full title in the opening credit sequence is Larry McMurty�s Dead Man�s Walk) is a return to epic storytelling by Larry McMurtry but this time it is not cattle being driven across the vastness of the American west but an expedition of men lost in a hostile wilderness of bluffs, scrub, rock and dry grass, the territory of the Indians who are very much more at home there. But again, as McMurtry has shown in the other films of the Lonesome Dove series he was involved in, what interests him is not really the action and spectacle, although the film contains a fair helping of both, but the dialogue and well-rounded characters. With Dead Man�s Walk, published in 1995, McMurtry went back in time to 1842 to visit a number of the characters from Lonesome Dove (which he published in 1985) when they were young. The main ones are Gus and Woodrow, of course, but in Dead Man�s Walk we see Gus become infatuated with Clara (Jennifer Garner), the great lost love of his life, as well as, briefly, we meet Maggie, the whore who will in the future be the mother of Woodrow�s son Newt. However, in Dead Man�s Walk Gus and Woodrow are not really the characters who drive the action, nor, I must say, the most interesting. ���� Although Dead Man�s Walk lacks the star power of the early film, the cast here is still impressive. F Murray Abraham, Oscar winner for Amadeus (1984), is very good as the driven commander, Patricia Childress is also good as a women with incredible courage and resolve while Eric Schweig is a ferocious, intelligent and frightening Buffalo Hump (who was a real person). The standouts however are Harry Dean Stanton, supporting man par excellence with 204 acting credits before his death, whose grizzled features and laconic outlook on life are wonderful, and Keith Carradine who carries the show as William �Bigfoot� Wallace. Wallace is another real person, a legendary Texas Range who saw more fights and Indians than most in his long and illustrious life before dying in 1899 at the ripe old age of 82 (SPOILER ALERT: highlight with mouse to read) unlike his fate in the film. ���� Shot in Texas, the deserts, buffs, rivers, scrub, salt plains and dusty towns and villages filmed by cinematographer Edward J Pei (who also shot Streets of Laredo) are visually impressive. Dead Man�s Walk also includes one of the most bizarre sequences in any western; an aristocratic lady, naked on a horse with a snake curling around her neck singing Verdi very loudly as she rides slowly towards a Comanche war party out for blood. No wonder the Comanche were spooked!! ���� Dead Man�s Walk is in the 1.33:1 aspect ratio, in NTSC and it is not 16x9 enhanced. ���� The video is the least impressive of the films included in the series despite Dead Man�s Walk being the most recent. Filmed in location in Texas some of the exteriors are sharp with strong detail, others are quite soft. Colours, however, are deep and vivid, including the blue of the sky, the red of the sunrise, sunset and the grass fire. Blacks are solid and shadow detail good, skin tones natural, brightness and contrast consistent. However, there are a range of artefacts including regular small marks, some bigger splotches (such as at 20:24 in episode 1, 20:00 in episode 2, 17:15 episode 3), sections with noise and edge enhancement, shimmer in scenes with jumbled rocks and motion blur. I will say however that none of this was too distracting. ���� No subtitles are provided except for some which automatically translate sections of Native American dialogue. ���� The layer change on both discs was not noticeable. ���� The audio is English Dolby Digital 2.0 at 192; it is surround encoded. ���� The audio is fine without hiss or distortion. Dialogue is easy to understand and the effects, such as gunshots, galloping horses, Indian war cries, the grass fire are clear and loud. The surrounds featured mostly ambient sounds, such as rain and thunder, but more usually the score of David Bell which was epic and effective. ���� This release of Dead Man�s Walk is part of the 8 disc Lonesome Dove: Four Miniseries Collection (see details in the summary section below). Dead Man�s Walk has been released as a stand-alone DVD (and reviewed on this site way back in 2004 here and as part of various Lonesome Dove DVD collections; some collections are similar to our release but are very pricey, others have the 4 series on single DVDs. The most complete set available, if you can get it, is the Australian Region Free 16 disc Lonesome Dove: Ultimate Collection which includes the same 4 films we have plus the 2008 prequel Comanche Moon and the 21 episodes of the TV series. Our 8 disc release from ViaVision is reasonably priced for this collection of four mini-series. ���� One expects that sequels, and prequels, would normally mean a reduction in quality from the original. Certainly, it would be hard to live up to the excellence of Lonesome Dove, one of the most acclaimed western series ever made, but Dead Man�s Walk with a fine screenplay by Larry McMurtry and Diane Ossana from the McMurtry novel, interesting characters, good acting, impressive desert landscapes, Texas Rangers, Indians and the Mexican army gives the series an impressive ending (at least until Comanche Moon came along 10 years or so later). In its own right Dead Man�s Walk is fine storytelling. ����The video and audio are acceptable, no extras. ���� The three feature length episodes of Dead Man�s Walk are split over two DVDs. 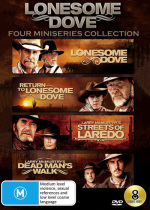 The series is included in the 8 DVD Lonesome Dove: Four Miniseries Collection from ViaVision together with Lonesome Dove (1989), Return to Lonesome Dove (1993) and Streets of Laredo (1995).